In fact, since April last year there has been only one green period in which the Nasdaq went down, an 80 point loss in September 2014. In the last 13 green periods the market went up 12 times. 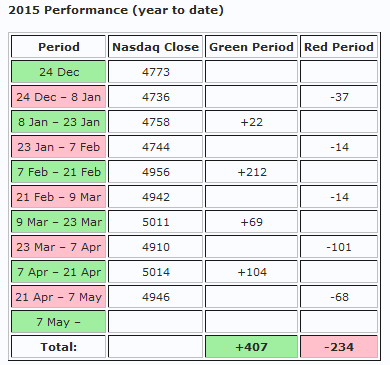 Looking at the red periods since April last year, the market went up only 5 times out of 14 periods. We have been keeping track of all green and red periods since we started this blog in 2009, and you can always look up the results on our lunar cycle tracking page. Whenever the lunar cycle has this kind of winning streak I start getting more emails, and more people start talking about it on forums, and many start using this cycle because they think they have found some kind of holy grail. That’s all very nice, but especially for newer readers I want to repeat: this is NOT the time to start using lunar cycles if you have never used them before. There is no reason to believe that this system will keep performing as it has done in the last 12 months, because historically the lunar cycle has worked only 60% of the time, not 90% or 100% of the time. The best time to start using a new method is always when it has just had a mediocre or bad period. Just like it is generally not a good idea to chase the market, it is better not to chase methods either. The market has gone sideways since February. The range continues to narrow. As I said last week, a breakout is imminent. But which way? Friday’s surge doesn’t really solve the puzzle. And my indicators have all converged towards the neutral line, not giving clear direction either way. We are in a new lunar green period, which normally favors a move to the upside. But maybe it is time for the lunar cycle to miss a beat? This is the kind of situation where I prefer to wait until the market shows its hand. 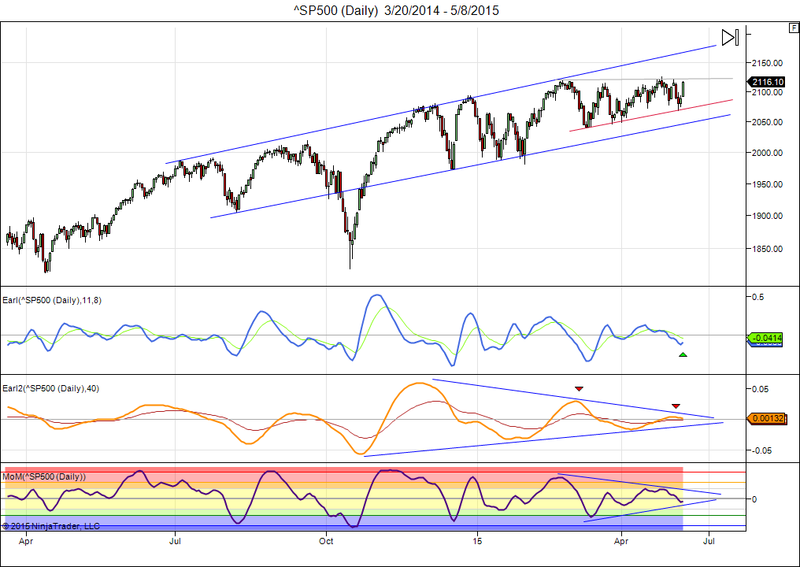 This entry was posted on May 11, 2015 at 9:28 am	and is filed under Financial Astrology, Market Commentary. Tagged: lunar cycle, performance. You can follow any responses to this entry through the RSS 2.0 feed. You can leave a response, or trackback from your own site.